We've read quite a few good stories and newswires involving porta-potties. Some people have used them to sneak looks at ladies' bums, dump babies, hide out, and of course, to just test gravity. Mostly, however, people destroy them. We've yet to find pictures of these beloved structures in the actual process of their criminally induced demise ... until now. 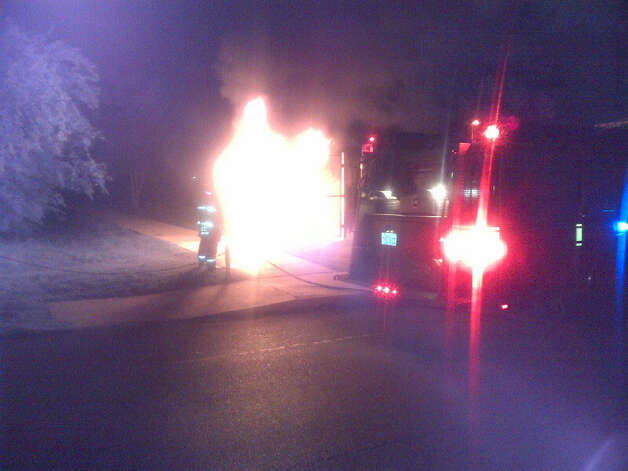 Today in San Antonio, firefighters were called to put out a porta-potty that had been set on fire. This fire was the second one set in the area, according to the San Antonio PD. Initially, the potties were being tipped over, and so the park brought in wider porta-potties; ironically, it was probably this switch that caused the fires. At the same time, up north in Illinois, another porta-potty "mysteriously" caught fire at a medical construction site. Advocate Christ Medical Center is building an outpatient site, and on the third floor of the unfinished structure, either someone suffered from eating way to many Doritos Locos Tacos, or someone just set fire to the poor, damned thing. The article cites the plastic seat of the potty as the source of the fire. If so, then someone might have pilfered Chief Thunderbutt's kimchi recipe. We did categorize this article under discussions; therefore please share your opinion on why the hell someone would set fire to a porta-potty in a multi-story construction site. 2 Comments on "Porta-Potty Photos: The Whipping Boys of Sanitation Aflame"
...say, any chance you could activate my forum account? I can't get anybody on email, and I never got a confirmation. My kimchi recipe usually only ignites toilet paper or burns holes in underwear, but I may tone it down a little anyway. It caused me to drop my membership in AARP and instead join URP which caters to the needs of seniors with acid reflux.